10% discount on orders over $1000. For over 30 years, Shift Calendars has brought quality products to serve the Firefighters and EMS workers throughout the United States. Shift Calendars is the first and oldest shift calendar company and will continue to provide quality products. With our many series of schedules, more than likely we have what you are looking for. Shift Desk Pads have become a very helpful tool for administration purposes and many other applications in the fire industry. The Shift Desk Pad is a full color, 17 ¼” by 23” pad with 12 months to a pad. Shift Calendar’s large two by three foot Shift Poster makes scheduling much easier on firefighters. These posters are extremely helpful when posted on the station wall where work occurrences and past, present and future events can be determined instantly and effortlessly. The Shift Poster is full-color and printed on thick, durable board. Our famous high quality, full-color Single Sheet, includes two handy (detachable) Wallet Calendars. The Single Sheet is 8 ½” by 14” including the wallets. After the wallets are detached, the Single Sheet is 8 ½” x 11” with all twelve months on the one sheet. Also, for a small fee, we offer laminating of the wallets. The Single Sheet is also available with a personalized imprint of your name or company name at a low additional cost. This feature is only available on the Single Sheets. The attractive 12-page Appointment Style is 9” by 12” and features a beautiful full-color glossy photograph to enhance its appearance in your home or office. The inside back cover of the Appointment Style features the following year, which is very helpful in projecting forward for birthdays, vacations, etc. "Shift Calendars is genuinely concerned with our overall satisfaction. This type of customer service is very important to our department." "I’ve had the pleasure of working with Shift Calendars for over 10 years and will look forward to working with them for another 10 years. Thank you Shift Calendars for your hard work and the integrity of your calendars." We carry over 19 variations of the 3 platoon 24 hour shifts. We carry Modified Detroit, 3's and 4's, 48-96 and etc etc. Chances are if you are on a 3 platoon shift, we most likely will have your shift or a variation of it. If you are looking for regular calendars, without the color coded days, you can find some on our Links page. 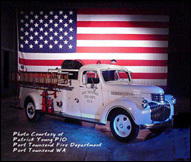 There are also links to excellent firefighter posters as well. 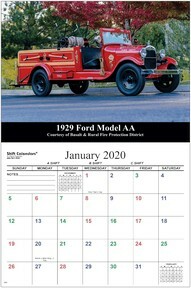 website designed by GREG DYER DESIGN and implementation by babymonkey StudiosCopyright © 1981-2019 Shift Calendars Inc.